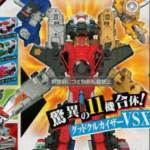 Tokunation › Super Sentai › New LupinRanger VS PatRanger Catalog Scans Reveal Upcoming Mecha Combos! 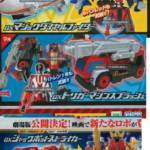 New LupinRanger VS PatRanger Catalog Scans Reveal Upcoming Mecha Combos! Some new images from the most recent Super Sentai merchandising catalog have surfaced online, giving us a quick look at the ever-expanding arsenal of Mecha to be used in Kaitou Sentai LupinRanger VS Keisatsu Sentai PatRanger! Both these new entries should add some much needed versatility to both teams. Topping off this lineup is the Jackpot Striker! A golden crowned repaint of the GoodStriker, this appears to be the Movie-exclusive Mecha for this years’ Super Sentai special feature. And rounding off the reveals this time around is a special Mecha Combo! The LupinRangers’ Dial Fighters & the PatRangers’ Trigger Machines will unite (along with the Mecha belonging to upcoming new Ranger Lupin/Pat X) to create a form tentatively known as Good Cool Kaiser VSX. Definitely some exciting times ahead for these Ranger teams! Stay tuned to TokuNation as we keep you up to date on all LupinRanger VS PatRanger reveals. All 6 main Mecha (plus X's) will combine for a team effort- the "GoodCool Kaiser VSX." The Splash Trigger Machine remind me to GoGo Fire from Boukenger. Since Jackpot Striker are used by Lupinrangers, probably the Patrangers will be stay to uses GoodStriker so Lupinkaiser and Patkaiser will be appeared at same time. Just had the best thought ever. All six of them end up in the cockpit. And then Benny Hill music ensues as they chase after each other around and around. Seven members because the Gold/Silver Ranger are included. That blimp is beautiful. Not to happy with Splash being red, but I guess it makes sense. That combo is a cluster and not in a good way. Love that blimp! 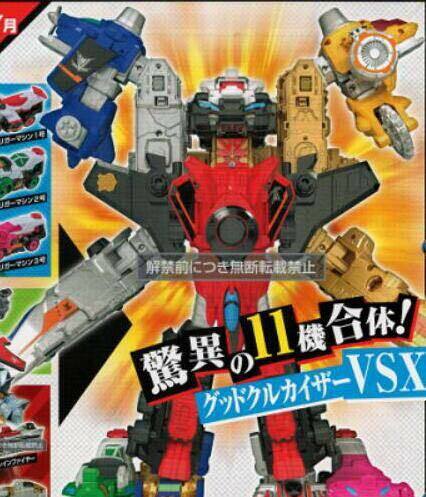 That's an awesome new addition to zord types we haven't had yet. And yay! This explains the peg holes on the Candy Kit! The mecha booties are finally here! Thieves gotta have their booties! 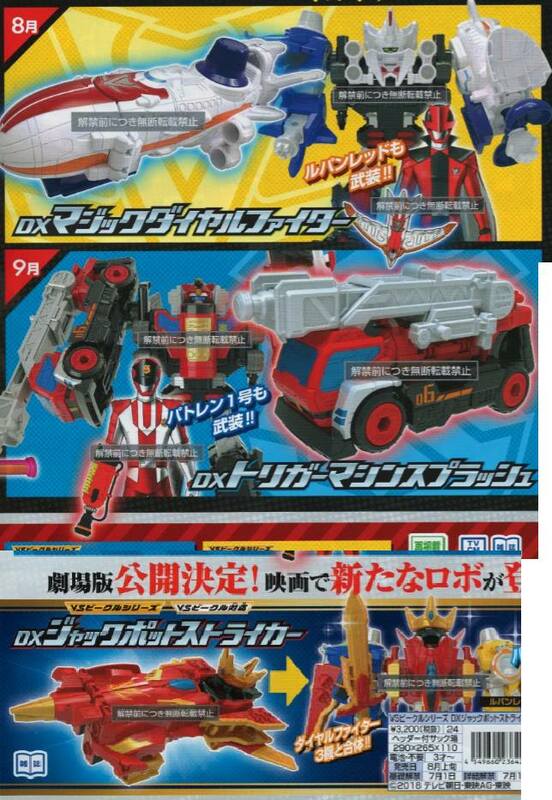 Can't wait for the Candy kit versions, it's going to be nice to have extra arm combos for Gokai and others. Wow, that combination looks pretty godawful. Like the machines (is this the first Zeppelin mech we've got?). It they make one, I'll probably try to get Jackpot in minipla form. The mega-combo confirms my (admittedly obvious) prediction but looks hideous. Loving the new Mechas and I'm just loving PatVSLupin in general. I'm super excited to find out how they're actually going to work around a side-switching Ranger who's personal mecha is used as a major thing for the other 6 rangers to be able to combine. Speaking of, assuming the Patrangers figure out the identities of the Lupins before the end of the series I'd really like to know what will happen to the Lupin Silver/Pat Gold, will he just stick to one form or be like Goodstriker. So much this! And while they’re doing that the Megazord is just standing there and the MOTW goes back to destroying the city.